Below are reviews of the best Nassau resorts in the Bahamas, New Providence Island, in 2019 : Sandals Royal Bahamian Spa Resort & Offshore Island, Breezes Resort & Spa Bahamas, Atlantis Royal Towers Autograph Collection, Hotel Riu Palace Paradise Island, Melia Nassau Beach Resort,Atlantis Beach Tower Autograph Collection, British Colonial Hilton Nassau, Atlantis Coral Towers Autograph Collection, Atlantis The Cove Autograph Collection, Comfort Suites Paradise Island, Atlantis Harborside Resort, Atlantis The Reef Autograph Collection. Atlantis, Royal Towers, Autograph Collection is a luxury family-friendly Nassau resort which sports easy access to complimentary attractions and larger rooms for comfort. Located on Paradise Island along a perfect stretch of white sand beach, this resort is the original of six segments within the massive Atlantis Resort. An added at Atlantis, Royal Towers, Autograph Collection are the several free attractions that include the marine habitat which is the largest outdoor aquarium in the world as well as the fun-filled 141-acre Aquaventure Park with waterslides and a lazy river. 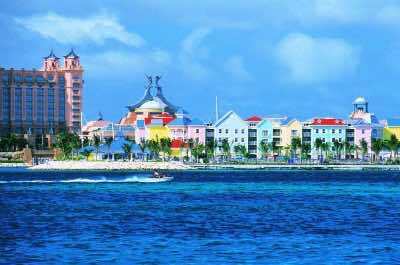 The high-rise pink colored building contains over 1,000 rooms and suites which were renovated in 2013 with a simple Caribbean decor. Guest rooms are large at 400 square feet and there are several categories. The higher you go in the building, the better the ocean and harbor views. Rooms can be connected for larger groups and families wanting more space. Atlantis, Royal Towers, Autograph Collection Nassau Resort has five types of suites that range from the smaller Regal suite to the Grand suites with a separate living area, a grand parlor and extra half-bathroom to a Presidential suite with two bathrooms to Royal suites which are multi-bedroom with a full kitchen and ideal families. All rooms and suites are furnished with a French balcony and have views of the ocean, resort, island, harbor or pool. The beach area is great for swimming and other watersport activities which can be arranged for an additional fee. You will enjoy easy access to the main complimentary attractions including the marine habitat and the Aquaventure Park. There is also an opportunity to swim with the dolphins at the 14-acre Dolphin Cay. The freshwater swimming pool Royal Palms is ideal for families and there are ten other swimming pools at the Atlantis Resort which range from kiddie wading areas to full blown lagoon-style with waterfalls. Dining options are numerous at the Atlantis, Royal Towers, Autograph Collection with access to over 21 restaurants and 19 bars within the Atlantis Resort complex. You can purchase a meal plan before your arrival which is helpful for families. Your choice within the Royal Towers includes Poseidon’s Table with a buffet for breakfast and dinner. Other options on the resort include Plato’s for lunch and Café Martinque has great ala carte French cuisine. Nightlife includes numerous options from a lively casino to themed beach parties to dancing at the nightclub. The Atlantis Kids Club is great and offers organized activities for children in several age groups. Children will enjoy the complimentary attractions and numerous swimming pools. Babysitting services can also be arranged for an additional fee. Atlantis, Royal Towers, Autograph Collection Nassau Resort contains a casino, dive shop, fitness center, game room, marina, movie theater and the full service Mandara Spa Atlantis. Atlantis, Beach Tower, Autograph Collection is the perfect choice for families that are seeking access to several complimentary attractions and a great fun-filled Nassau resort. Located on Paradise Island along a stretch of public shite sand beach, this resort has the most reasonably priced accommodations than the other five segments of the massive Atlantis Resort. The high-rise Atlantis, Beach Tower, Autograph Collection has over 500 rooms and suites that are furnished in a bright tropical decor. Each room is similar in size and can be connected for larger families needing more living space. Rooms have either a view of the resort or water from a private balcony. The beach area is great and swimming is fun. You can arrange for your favorite watersport activity at the onsite dive shop. You will also enjoy the complimentary attractions like the 141-acre Aquaventure Park with numerous waterslide and a lazy river as well as the marine habitat areas which form the largest outdoor aquarium in the world. There are eleven freshwater swimming pools for you to enjoy at the Atlantis, Beach Tower, Autograph Collection Nassau resort and you can indulge in family-friendly pools. Families can purchase a meal plan before arrival which includes breakfast and dinner choices. Additional dining options are numerous within the Atlantis Resort. You have access to over 21 restaurants and 19 bars for your enjoyment. There are several buffet-style restaurants such as the Marketplace Buffet for breakfast and dinner. Ala carte restaurants vary from fine dining like the Bahamian Club to casual Mediterranean at Olive’s to the Village Burger Shack. Nightlife is quieter in this section of the Atlantis Resort and you must travel by shuttle to the casino or nightclub. The Atlantis Kids Club is great for children with organized activities as well as a pottery studio, game room and a build-a-bear workshop. Children of all ages will enjoy the Aquaventure Park, the marine habitat areas and the numerous swimming pools designated for families. You can also arrange for babysitting services for an additional charge. Atlantis, Beach Tower, Autograph Collection Nassau resort contains a casino, dive shop, fitness center, game room, marina, movie theater and the full service Mandara Spa Atlantis. The Atlantis, Coral Towers, Autograph Collection is an ideal mid-range Nassau resort that caters to families and groups. 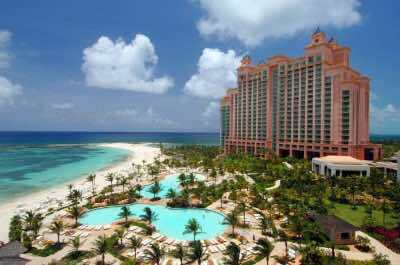 Located on Paradise Island, this property is one segment of the larger Atlantis Resort which is managed by Marriott. The high-rise property has over 600 units that have a contemporary decor and is close to the Marina Village. Accommodations range from guest rooms at 300 square feet which feature a private balcony to one and two-bedroom Regal suites which range in size from 542 to over 800 square feet with two private balconies as well as views of the harbor or ocean. There are also a number of upgraded suites available with multi-rooms like the Presidential, Governor and the Sun suite even has a functional kitchenette. The size of each room makes them ideal for families. The private beach area at Atlantis, Coral Towers, Autograph Collection Nassau resort is nice with white sand and excellent swimming. You can also arrange their favorite watersport adventure through the dive shop or harbor. Families will like the close proximity to the 141-acre Aquaventure Park which sports a lazy river and numerous waterslides as well as the short distance to the marine habitat park which is the largest outdoor aquarium in the world. You may choose a dining plan for breakfast and dinner or a pay-as-you-go option. There are 21 restaurants and 19 bars within the Atlantis Resort. You have easy access to Seagrapes for a family-friendly buffet, Virgil’s BBQ as well as the Paradise Bar and Grill. There are low cost and fine dining choices that are sure to please everyone in the family no matter what your proposed budget. You can easily access several of the eleven freshwater swimming pools on the complex including the BLU pool and the Paradise as well as the Predator Lagoons. Children will like the extra amenities geared toward them with the waterpark and marine habitat area as well as perhaps swimming with dolphins at the 14-acre Dolphin Cay for an additional fee. There is a multi-tier kids club with organized activities for children 1 to 17 years of age. 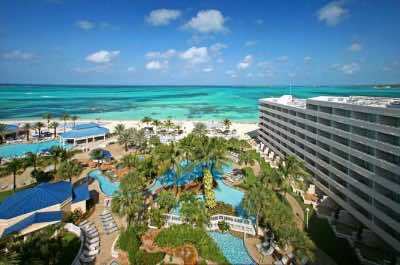 Atlantis, Coral Towers, Autograph Collection Nassau sesort has a dive shop, fitness center (added fee), tennis courts and the full service Mandara Spa Atlantis. The Cove Atlantis, Autograph Collection is the perfect upper-end luxury Nassau resort for couples and families who want the best of what the Atlantis Resort complex has to offer. Located on Paradise Island along a secluded stretch of beach within the massive Atlantis Resort, this high-rise property was constructed in 2007 and offers a fresh bright decor. There are 600 suite-style units within the Cove Tower in nine different categories. Each style of suite has a different floorplan from an Ocean suite with a separate stepdown living area and over 600 square feet to the one-bedroom 924 square feet Indio and Azure suites. There are several styles of two-bedroom suites with over 3,000 square feet. All units have a private balcony and some have views of the harbor or ocean. You can also upgrade each category to Cove Club which features personal concierge services and a private lounge with breakfast, appetizers as well as drinks throughout your stay. You can indulge at the beach on a quiet section of white sand that is surrounded by a great tropical landscape. You can arrange various motorized and non-motorized watersport equipment at the harbor or onsite dive shop. Patrons enjoy a semi-private freshwater swimming pool called the Cascades pool which is shared with you from the Reef Tower. There is also the adults-only party pool called Cain at the Cove when you want a more grown-up experience as well as the other ten pools within the Atlantis Resort. You have complimentary access to the 141-acre Aquaventure Park which sports numerous waterslides and an excellent marine habitat area that is housed in the world’s largest outdoor aquarium. Dining plans are available for you or you can choose a pay-as-you-go option. The Cove Atlantis, Autograph Collection Nassau resort has a couple of dining options which include the upscale buffet-style restaurant Mosaic for breakfast, lunch and dinner as well as Mesa Grille which serves Southwestern cuisine designed by celebrity chef Bobby Flay. 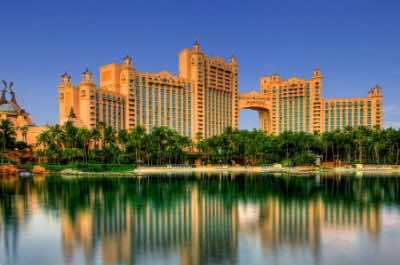 Overall, there are 21 restaurants and 19 bars throughout the Atlantis Resort which can be accessed by a free shuttle. There is a multi-tier kids club available for children aged 1 to 16 which includes age appropriate organized activities. Children will enjoy the free amenities of Aquaventure Park and the marine habitat area as well as perhaps swimming with dolphins at the 14-acre Dolphin Cay. The Cove Atlantis, Autograph Collection Nassau resort contains a fitness center, dive shop, tennis courts, golf course (added fee) and the full service Mandara Spa Atlantis. The Atlantis Harborside Resort is an ideal choice for families looking for an upscale timeshare property. Located on Paradise Island near Nassau Harbor, this Nassau resort is one of six segments that compose the Atlantis complex. The brightly colored Royal Tower consists of Colonial-style low-rise buildings which are a favorite with families because of the added living space. There are 392 condo-style units that range from one to three-bedrooms, each with a full kitchen, private balcony and views of the yachts or Nassau Harbor. There is no direct beach access from this portion of the Atlantis complex but there are free shuttles that will take you to private white sand beach. The dive shop as well as the harbor can arrange all of your motorized and non-motorized watersport adventures. You have complimentary access to two wonderful family attractions which include a huge marine habitat that is housed in the world’s largest outdoor aquarium as well as the massive 141-acre Aquaventure Park with its lazy river and waterslides. Families will also enjoy the opportunity to swim with dolphins for an additional fee at the 14-acre Dolphin Cay. There is a freshwater swimming pool which features fountains and a children’s swim area. You have access to other pools within the Atlantis complex at the Beach, Coral and Royal Towers. Dining plans are available but options are limited unless you take the free shuttle to one of the other Towers. Families enjoy the breakfast buffet at Seagrapes, Asian cuisine at Chopstix and lunch is served at several poolside cafes as well as pizza at Marina Pizzeria. 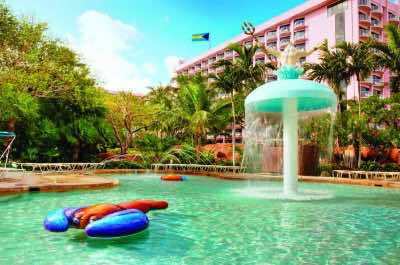 Atlantis Harborside Nassau Resort is fabulous for children and boasts a multi-tier kids club that range in ages from 1 to 17 years of age. Each club has age appropriate organized activities and is available throughout the day as well as evening. This Nassau resort has a dive shop, fitness center, movie theater, golf course (additional fee), tennis courts, harbor and the full service Mandara Spa Atlantis. Atlantis, The Reef, Autograph Collection is a perfect luxury Nassau resort for families that want the comfort of home and the ability to save money on a few home cooked meals. Located on Paradise Island, this property is one of six segments that compose the enormous Atlantis complex which is managed my Marriott. This high-rise property was constructed in 2007 and is one the newest areas within the Atlantis complex. There are 500 units with a fresh contemporary decor and a residential atmosphere. Accommodations range from studios to one and two-bedroom condominiums that are equipped with a full kitchen or kitchenette as well as private balconies with views of the ocean. Cove Beach is an excellent place to relax with white sand and a surrounding tropical landscape as well as excellent swimming opportunities. You will find a variety of motorized and non-motorized watersport equipment for rent from local vendors. This portion of the Atlantis complex does not contain many dining options other than a Starbucks. There are however, many dining options located within the Cove Tower and families enjoy the buffet-style Mosaic and Bobby Flay’s Mesa Grill serves eclectic Southwestern cuisine. Overall, there are some 21 restaurants and 19 bars within the Atlantis complex as a whole and there is a free in-house shuttle system to help with the walking. One added bonus for families are that each unit has a full a kitchen and there are plenty of grocery stores which can stock your refrigerator. You can enjoy one of the eleven freshwater pools on the complex and families enjoy the semi-private Cascades pool which is perfect for relaxing. While staying at the Atlantis, The Reef, Autograph Collection Nassau resort you have complimentary access to two attractions at this resort which include a marine habitat which is the world’s largest outdoor aquarium and the 141-acre Aquaventure is the ideal water park that is full of excitement. You may also decide to swim with a dolphin wat the 14-acre Dolphin Cay. The Atlantis Kids Club is fabulous at this property and children will have plenty of organized activities for them to enjoy as well as a game room and arcade. Parents may also arrange babysitting services for an additional charge. The Reef Atlantis, Autograph Collection Nassau Resort contains a casino, dive shop, fitness center (added fee), tennis courts and the full service Mandara Spa Atlantis. The Sandals Royal Bahamian Spa Resort and Offshore Island is the ideal choice for adult couples-only looking for superior amenities and plenty of complimentary activities. Located on Cable Beach along the northern shoreline of the island, this all-inclusive Nassau resort is perhaps the premier romantic all-inclusive property on the island. Sandals Royal Bahamian Spa Resort also offers a unique private island experience for you with free transportation hourly by boat or you can access during the day by kayak. Sandals Island is complete with two white sand beaches, the Stew Fish Restaurant serving into the evening and a lagoon-style freshwater swimming pool that has a view of the Atlantic Ocean as well as an energetic swim-up bar. The resort has several high-rise modern buildings that have a luxurious festive decor. Accommodations at Sandals Royal Bahamian Nassau resort are offered in three different levels from luxury to club to butler. Each level has upgraded amenities which are unique. There are just over 400 rooms and suites at this resort which offers 30 different styles and categories for you to choose. Luxury level rooms include nine choices that range from the most basic Royal Village Deluxe which has a resort garden view but no patio or balcony to the Balmoral Oceanview Luxury which sports a balcony and views of the Atlantic Ocean. Club level status includes access to a private lounge, game room and dedicated concierge services. There are 10 choices at club level which includes rooms and suites like the Balmoral Zen Garden Walkout which boasts a private walkout balcony with views of the Zen Garden to the Balmoral Poolside Walkout to a Windsor Garden Grande Luxe Walkout Oversized Junior Suite to a Balmoral Beachfront with direct beach walkout access. Butler level includes eleven selections which range from the Royal Village One-Bedroom Villa Suite with an outdoor soaking tub to the Windsor Oceanview Walkout One-Bedroom Royal Suite to a Windsor Oceanfront Walkout One-Bedroom Royal Suite with direct beach access. No matter what your budget or desires there is a perfect unit for you. The beach areas to choose from are spectacular with white sand and plenty of room for relaxation or fun. Sandals Island has two distinct beaches with one dedicated for games and the other for quiet relaxation. Sandals Royal Bahamian Nassau Resort offers a plethora of complimentary motorized and non-motorized watersport equipment including water skiing as well as unlimited scuba diving for certified divers. The resort has a fulltime entertainment staff which keeps things lively with team games, limbo lessons and beach parties in the evening. There are two freshwater swimming pools which both have a swim-up with one on the private island and the other overlooks the ocean from the resort. Dining at this resort is spectacular with ten choices from a buffet-style breakfast at Spices to a beachside lunch at Stew Fish or Royal Café to luxurious fine dining in the evening at Baccarat for French cuisine and Kimonos for authentic teppanyaki Asian dishes. Nightly entertainment is abundant with karaoke, a piano bar, shows in the main theater, live music and themed beach parties. This is a couples and adults-only complex and does not offer services for children. This all-inclusive Nassau resort contains a dive shop, a private island, fitness center, tennis courts and the full service Red Lane Spa. Breezes Resort and Spa Bahamas is the perfect selection for a mid-range all-inclusive Nassau resort that caters mainly to adult singles, couples and families with children over 14 years of age. Located on a stretch of Cable Beach along the northern shoreline of the island, this resort is one of the best values on Nassau. 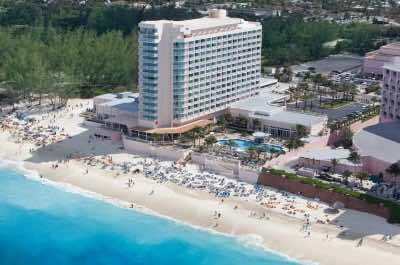 Breezes Resort and Spa Bahamas is composed of two high-rise modern buildings which house almost 400 rooms and suites. Not all rooms at this resort have a balcony or patio. The interior decor is pleasant with a simple Caribbean flare. There are four styles of rooms which have a similar size and floorplan as well as views of the garden, ocean or beachfront. Some rooms have direct beachfront access from a furnished patio. One-bedroom oceanfront suites have big views of the Atlantic Ocean and added living space. Presidential suites are more spacious with a colonial decor and large views from the floor to ceiling windows. Cable Beach has excellent white sands with plenty of space for relaxing and beach games. You will enjoy complimentary use of non-motorized watersport equipment and the swimming is great at this resort. There is a fulltime entertainment staff which hosts a variety of lively activities throughout the day. You can also try the rock climbing wall and trapeze for a special adventure. Breezes Resort & Spa Bahamas Nassau Resort has three freshwater swimming pools which include a swim-up bar at the main pool. There is also a smaller quieter pool for relaxing and an activity pool. You can enjoy lunch beachside at Reggae Café. Dining at Breezes Resort and Spa Bahamas consist of five restaurants with Banana Boat serving international buffet-style cuisine for breakfast, lunch and dinner. Other ala carte choices include gourmet specialties at Eden and Garden of Eden, Martino’s for Italian and Munasan serves Asian cuisine. Nightlife includes live music, a piano bar, themed beach parties and the Hurricanes Nightclub allows dancing into the morning. This resort does not offer services for children less than 14 years of age and is somewhat livelier than most resorts during spring break. This all-inclusive Nassau resort contains a dive shop, fitness center, game room, tennis courts and the full service Blue Mahoe Spa. The Hotel Riu Palace Paradise Island is the ideal selection for couples, families and groups that are looking for a lively atmosphere and plenty of amenities. 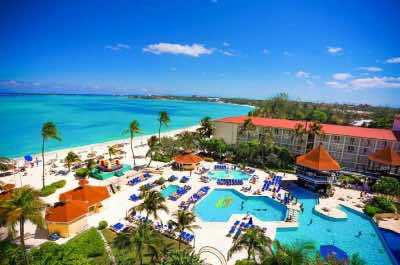 Located on Paradise Island, this all-inclusive Nassau resort is situated on Cabbage Beach next to the giant Atlantis Resort complex. 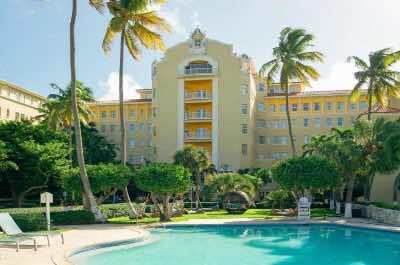 Hotel Riu Palace Paradise Island has 379 rooms and suites that are situated in one high-rise building. Accommodations range from standard guest rooms with a private balcony and view of the Atlantic Ocean to Junior suites that have more living space with views of the ocean or island to one and two-bedroom suites with separate living areas, more space and balconies that have an ocean view. The Cabbage Beach beach area is superb with lots of white sand but can have a few vendors selling items on this public beach area. The swimming is good and you will enjoy complimentary use of non-motorized watersport equipment. There is a lively atmosphere at this resort and can be raucous at times. You will enjoy one freshwater swimming pool which features a swim-up bar as well as poolside service. You will be close to the attractions at Atlantis Resort which include the fabulous Aquaventure Park which you can experience for an additional fee. You can dine at five restaurants that include buffet-style dining at Atlantic for breakfast, lunch and dinner as well as four ala carte options in the evening that include Tengoku for Japanese dishes, Sir Alexander with eclectic gourmet cuisine, the Bahamas Steakhouse and Krystal serves exciting fusion creations. Nightly entertainment includes live music, themed beach parties, shows in the main theater and karaoke. 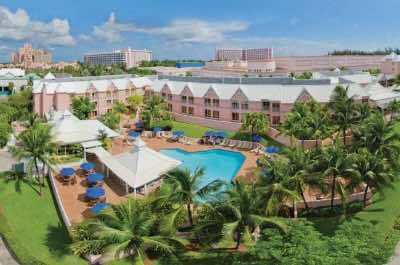 Hotel Riu Palace Paradise Island Nassau resort has a kids club for children aged 4 to 12 years old with organized activities. This all-inclusive Nassau resort contains dive shop, fitness center, game room and the full service Renova Spa. The Melia Nassau Beach Resort is the ideal selection for couples and families that are seeking a superb beach location. Located on Cable Beach along the northern shoreline of the island, this all-inclusive Nassau resort offers plenty of amenities that will please families. Melia Nassau Beach Resort contains over 700 rooms and suites in one high-rise building that faces the Atlantic Ocean and pool areas. The interior decor is a light Caribbean flare with subtle colors. There are four styles of rooms which include Classic Island, Deluxe Pool, Premium Ocean and Level. All of these rooms have a similar layout and size at just over 300 square feet as well as a private balcony with varying views. The Level junior suite has more space at 550 square feet and views of the ocean. One and two-bedroom suites range from 950 to 1,300 square feet with separate living areas as well as private balconies with a view of the Atlantic Ocean. The Level Presidential is similar as the two-bedroom suite and offers upgrade views from the top floors. Guests that upgrade to Level status accommodations will enjoy additional amenities like a private lounge, in-room aromatherapy and advance reservations at restaurants. Cable Beach is a fabulous stretch of white sand which offers plenty of solitude and swimming opportunities. You have access to complimentary non-motorized watersport equipment and you can arrange other water activities at the dive shop. Melia Nassau resort has a fulltime entertainment staff which hosts events like bingo, dance lessons and water aerobics throughout the day. There are three freshwater swimming pools which include a swim-up bar and waterfalls for you to enjoy while you gaze out over the ocean. Dining options include six restaurants like the Market Place with an international buffet for breakfast, lunch and dinner. There are five ala carte dining options for lunch and dinner that includes Aqua for Italian as well as Nikkei which serves up specialties from Japan, Peru and Cantonese. Nightlife at the Melia Nassau Beach Resort includes live music, themed party nights, a casino and shows geared for families in the main theater. The resort has a great kids club for children aged 5 to 12 years of age with organized activities. Babysitting services can also be arranged for an additional fee. 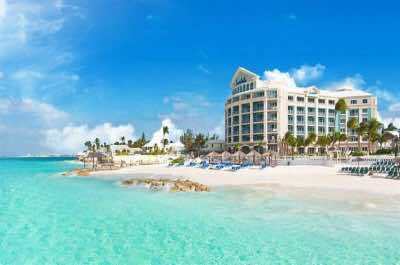 This all-inclusive Nassau resort contains a casino, dive shop, fitness center but there is not a full service spa. The British Colonial Hilton Nassau is the perfect luxury choice for business travelers and couples who are looking for a beach resort near the city center. Located on a small stretch of private area along Western Esplande Beach on the northeastern shoreline of the island, British Colonial Hilton Nassau Resort has a classic British Colonial architecture which stands out on the island. This high-rise resort has a Caribbean decor interior with 288 rooms and suites. City and Harbor view rooms are similar in size with varying views from your private balcony. One-bedroom suites offer more space and views of the island or harbor from a private balcony. You can upgrade your experience to Executive level and receive access to a private lounge for breakfast and afternoon refreshments as well as cocktails. The beach area is small and overlooks the harbor. You can rent just about any type of motorized and non-motorized watersport equipment from local vendors within the hotel. Swimming can be good at times and there are lounge chairs for you on the beach. The British Colonial Hilton Nassau has one freshwater swimming pool with a nice deck that allows for relaxation. British Colonial Hilton Nassau Resort has two restaurants onsite with Aqua serving an ala carte menu of international favorites for breakfast, lunch and dinner as well as the Patio Bar and Grille which serves poolside. You are within walking distance to several fine dining options like Lukka Kairi Restaurant and Bar for Caribbean-style cuisine and Graycliff Restaurant serves excellent French delicacies. Nightlife can be found nearby at Senor Frog’s and Fat Tuesday. The resort is family-friendly and offers family packages. Children can enjoy specific organized activities and babysitting services can be arranged for an additional fee. 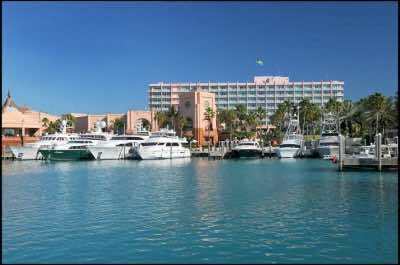 This Nassau resort complex contains a fitness center and upgraded business services. The Comfort Suites Paradise Island is an ideal mid-range selection for couples and families looking for a Nassau resort. 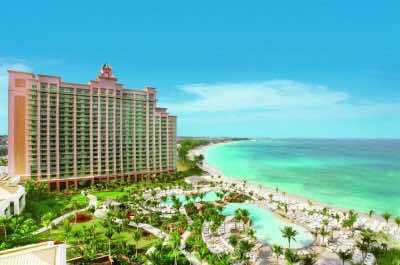 Located on Paradise Island, this property is situated next door to the massive Atlantis complex. An added bonus for you at this resort is that they have access to many of the attractions located within Atlantis including the 141-acre Aquaventure Park, numerous freshwater swimming pools, the private beach area and the marine habitat which is the largest outdoor aquarium in the world. This low-rise resort has 233 junior suites that have been recently renovated in 2013 with a fresh Caribbean decor. Each junior suite has a private balcony and extra living space for families. Beach access can be found by taking a shuttle to the neighboring Atlantis resort where you can arrange all of your favorite motorized and non-motorized watersport adventures. While staying at the Comfort Suites Paradise Island you will enjoy a complimentary American breakfast and Crusoe’s Garden Restaurant serves casual cuisine for breakfast, lunch and dinner. You also enjoy access and signing privileges at the 21 restaurants located within the Atlantis resort complex. You may also dine at the nearby Marina Village where there is a Johnny Rocket’s, Murray’s Deli and Marina Pizzeria. There is one large freshwater swimming pool which has a swim-up bar. Children and families will enjoy the multi-tier kids club available through the resort's partnership with Atlantis resort. Comfort Suites Paradise Island Nassau resort does not offer added amenities like a fitness center or full service spa.